I'm reviewing this movie fresh--I hadn't heard anything about it, hadn't read any other reviews, I just felt like seeing a movie this morning, and the poster looked interesting. I've come out, had lunch, a shower and a cup of tea to let the film settle, so here goes. 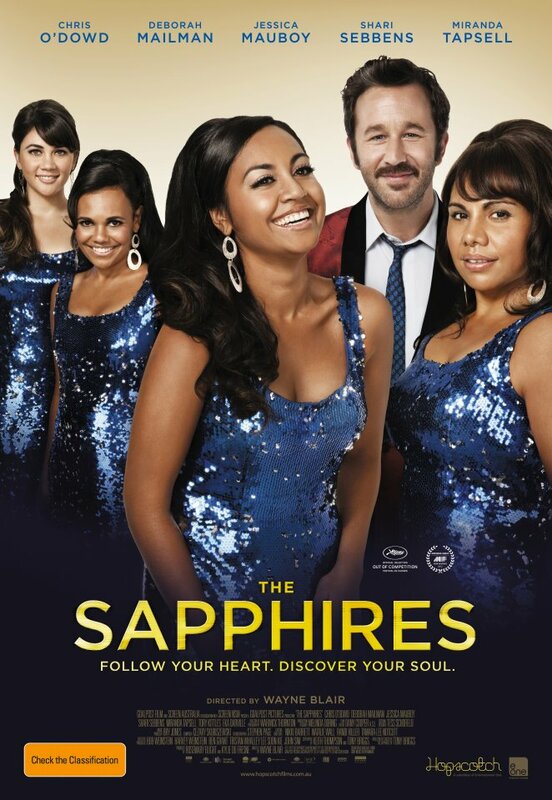 The Sapphires takes us to a remote Australian town where we find four young girls who have an amazing talent for singing and harmonies. They try, and fail, to convince local audiences of white Australians that they have something, until one day the comic relief character 'Dave' (Chris O'Dowd) shakes up their style and mentors them to new heights. From there they go on to entertain American troops in Vietnam while confronting issues as warmed over as racism, family responsibility, and war. While 'Racism' and 'War' certainly aren't warmed over topics, the Hallmark card TV-movie-of-the-week approach the writers have taken to them is. There's nothing to chew on or really think about; and like many before it, this particular product of the Australian film industry plays it far too safe. Especially on the topic of racism, The Sapphires weakness is in it's writers: too afraid of offending someone, they fail to entertain anyone. Worse still is the heavy-handed nature with which anything substantive is treated. In one particular scene (in the helicopter) the concept of racism is unnecessarily inserted into a scene just to add some extra drama, as if it's vitamins in bottled water, and nothing comes of it. In that respect, it really lacks a strong narrative, if the story of the four girls is a vine, it has nothing to wrap itself around to grow further. It comes close to doing so with a plot strand involving Australia's stolen generation, but it's a strand which isn't pulled on enough. The acting isn't great from anyone, really, and when after 60 minutes of seeing how much of a mother bear elder sister Gail is to her younger siblings, we're blatantly told by Dave that she's the 'mother bear'. You know, just in case we were 60 minutes late into the cinema, or maybe we're all drooling idiots. For all that's wrong with it, for the several times I rolled my eyes and said to myself 'come on, we can do better than this TV drivel', there was something about the film which just made me smile. It is irrepressibly cheery. A large part of that may be the soundtrack; Motown soul with an international flavour, sung wonderfully by our own Jessica Mauboys in the role of Julie. It could be the fact that The Sapphires is based on a true story, and through all the AFI-award-baiting sheen the story of the real Sapphires has been given, we the audience can imagine the true story beneath it and wonder, and archival footage and concurrency with the Vietnam war and the assassination of MLK helps us to do exactly that. It could also be the sheer likeability of the cast, in spite of the soapy dialogue they must wade through. That is, the actors have a warm and sympathetic screen presence in spite of the characters they must portray. I would have written this review with a much lighter and cheerful tone had I have written it straight out of the cinema and amongst the reasons for that would be the simple fact that I still was smiling fifteen minutes after it had ended. 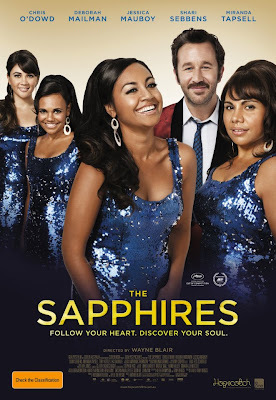 There is a lot to dislike about a film which employes as many TV movie-of-the-week tropes and narrative devices as The Sapphires, but what is there to like about it is a little less obvious. It's a film which at it's worst is playing it safe to the point of boredom, cheesy, and predictable. But at it's best, it's charming, endearing, and smile-inducing.